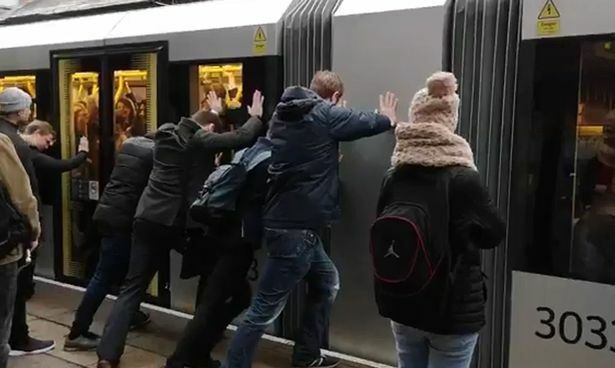 This is the astonishing moment Metrolink passengers were asked to push a tram to one side to help it move. The incident was filmed by a shocked commuter as he waited for a tram at the Brooklands tram stop on Tuesday morning. In the clip passengers stood on the platform can be seen attempting to push the tram to one side, while laughing to themselves. The vehicle was full with commuters. It is understood the tram was packed full with passengers and the driver was unable to shut the doors. The passenger who took this clip and tweeted it, said: “Passengers at Brooklands this morning being asked to push the tram to one side to help get it going. #WeDoThingsDifferentlyHere. According to witnesses, the driver got out to try and manually close them, but when they shut the tram was unable to move so he asked for people to push the tram to get it moving. Another passenger on the platform, Sam Dyson, of Brooklands, said: “I was about to get on the tram, the doors seemed to jam. It was there for about five minutes like that, eventually, the driver came out of the cabin to try and sort it out. “On the tannoy, the driver said ‘Can everyone push against the tram?’ It managed to move away. “It was a bizarre experience, but it seemed to work. The clip was shared on social media by Twitter user @JBwol. Transport for Greater Manchester’s head of Metrolink Danny Vaughan said: “I’d like to thank customers for rolling up their sleeves to help keep Greater Manchester moving. “The video perfectly sums up how people in Greater Manchester deal with life in general, they get stuck in and look out for each other. “Thanks to the action of the driver and those on the platform, the tram was able to continue and not delay any other services.